Whenever we see oil stains on clothes, we rush to the dry cleaner to get the stains removed. But, now you don’t need to run to your dry cleaner for getting the stains removed. You can easily remove the oil stains on clothes at your home. Several remedies help in removing even the toughest of stains without causing any damage to the fabric. This is just a general tip but, a very important one indeed. The garment care label is not an adornment that is stitched to the cloth for enhancing its look, and it carries much vital information that you must know. The manufacturer’s advice always counts. So better you check the label and then only use harsh detergents or hot water. This is one of the oldest home remedies to remove the tough oil stains from the clothes. But, not all get it right. You might have used this remedy but, could not have obtained the desired results. Often wondered why? Let me tell you the correct way of using talcum powder on clothes to remove the stains from them. All you need to do is to cover the whole stain with a copious amount of talcum powder. You can use any talcum powder for the matter. 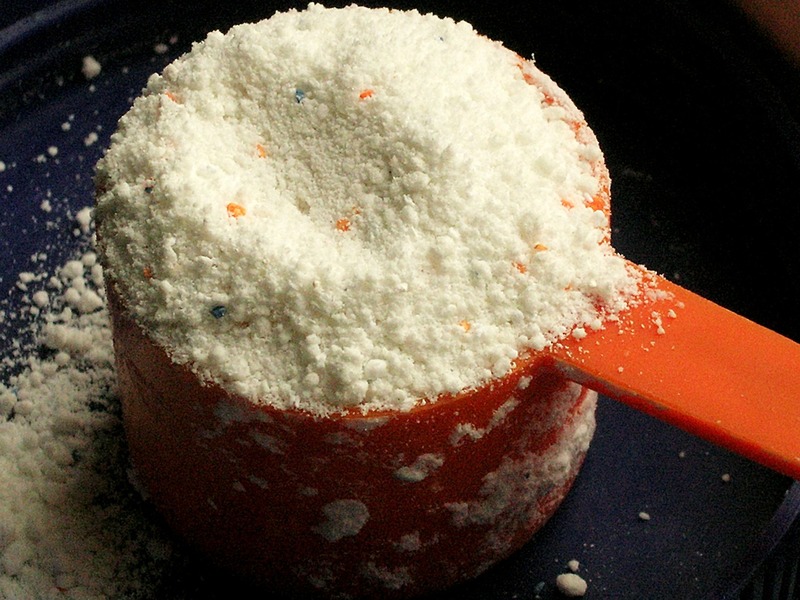 You can also use a baby powder or cornstarch for removing the stains from clothes. Now, leave the cloth covered in powder for a few hours in a warm place. Keeping the powdered covered stained cloth overnight is a better idea. Keeping the cloth at a warm place ensures that the powder completely absorbs the oil. Then, clear the powder from the cloth and wash it. If the stain still persists, apply the powder again and keep it for some time before washing. Keep repeating till the stain is completely gone. If you want to know the most fuss- free way of removing hard oil stains from the clothes, keep reading. Rubbing chalk on the stain does the work. All you need to do is take a piece of chalk and rub it over the stain. Let it stay for a few minutes so that the chalk totally absorbs the oil. Rinse the cloth and you will see the spot nowhere. Coke is not just to drink but, it serves many other purposes too. Coke is an amazing remedy to remove the oil stains on clothes. Just pour some coke over the stain. Let it stay for about an hour or two so that the stain gets soaked in coke. Now, rinse the cloth and let it dry in the air. You will see no stain after the cloth dries. Spraying hairspray on hair makes a great hairstyle and spraying hair spray on clothes help to get rid of oil stains. Just spray the hairspray on the stain and rinse it to remove the oil stains from the clothes instantly.